Everything has been blasted by the wind. Can you see the sled in this picture? Clear, whipping ground snow, -20F/-28C, 50 to 70 km/h gusty NW winds. It is cold. I remember not to long ago when Eric was developing the Collaboration Zone "The Big Freeze" and he asked me if we often got really cold out here. Paul and I both answered "rarely, if you dress properly we're almost always warm." Well, today is one of those rare days. Actually, the last couple of days have been cold. It is not so much the actual temperature, rather the wind. It is howling out the Northwest. The wind has been blowing hard for the last five days. Yesterday, we did have a small window of relative calm and did not really blow again until right when we had set up camp - very lucky for us. It is a lot harder to set up the tent, stake out the dogs, and get everything set for the night when the wind is so strong. When it blows this hard, we can become windburned or frostbitten in seconds because of the extreme windchill - it is very dangerous. Take a look at the windchill chart and determine how many seconds we can have our skin exposed on a day like today. I just had to go to the bathroom, so I can tell you from personal experience - not long! We decided this morning that it was not worth traveling in this weather. Navigation is simply too hard and dangerous. Instead, we took a "storm day" in the tent. We have spent most of today trying to dry our gear and get organized. It has been necessary to do everything as fast and efficient as possible these last couple of days, and our skills have definitely been put to a test. It is hard to get the tent warm enough to dry the gear at night when it is so windy. Although we had the lantern going and both burners on our stove last night, we just could not get it warm enough in here in the tent that it could dry our windblown and snowpacked clothes. This could be a serious problem. We are both wearing 3-4 layers of clothing, hats, and gloves inside of the tent and still could barely keep warm. That's rare. One way we gauge the temperature is to look at the inside of the tent walls. If the wall is icy half way up, it is usually about -35 F outside. Last night, the walls were icy 2/3 way up! 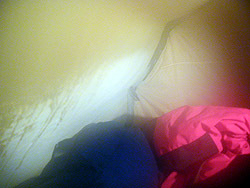 Frost half way up the tent wall means an outside temperature of -35F. Last night, the walls were icy two-thirds of the way up. We gauge wind speed by looking at the lantern hanging down from a loop in the tent ceiling. If it kind of jiggles back and forth it is windy out; If it is swinging, it is a storm day. Right now it is swinging! We have only one burner going on the stove to save a little fuel, and we are both in our sleeping bags. My pen is having a hard time writing (I write by hand before we turn on the computer to save battery power) and I can easily see my breath. Paul has just been outside checking on the dogs. They are all doing good. We built little walls near them as a wind block and they curl up and have the snow drift over each dog - like an insulating blanket. They have done a great job running in these difficult conditions. The "Dog of the Week" is definitely Cola. When the going got really tough, she just put her head into the wind and kept going. 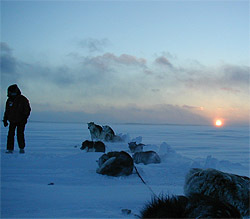 The lead dogs actually use the wind for navigation. They "read" the wind and orient themselves in the right direction. The best leaders can run straight as an arrow; however if the wind shifts during the day, they can easily get confused. They also need to listen to which way we want them to go. We direct the dogs on a particular bearing yelling out the commands "gee" and "chaw" (right and left). A relatively calm sunset before the wind really starts blowing again. Wind direction often changes and it is easy to become confused when navigating. However, "the wind" is still one of the most closely observed, and frequently discussed, phenomena in everyday arctic life. Most elders have vivid childhood memories of being sent outdoors each morning to check the weather. Their reports, once confirmed and considered, would dictate the days activities. The Inuit talk of four primary winds: Uangnaq, Kanangnaq, Nigiq, and Akinnaq. We know those winds as WNW (west/northwest) which comes from 296 degrees on a compass, NNE/19 degrees, ESE/119 degrees, and SSW/202 degrees. Out here on Hudson Bay, we are most often confronted and concerned with the opposing west-northwest and east-southeast winds. To the Inuit, the arrangement of Uangnaq (west-northwest) and Nigiq (east-southeast) as "opposites" is symbolically important. The traditional belief states that Uangnaq is a woman and Nigiq is a man, and that the two do not get a long all that well. They are said to retaliate against each other. Out here it is relatively common to have a west-northwest gale followed by a contrary blow from the east-southeast (could it be a woman and a man arguing?). Besides from having such a huge impact on daily life, the winds are actually an important way-finding tool for the Inuit. 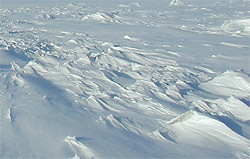 The wind works the snowy landscape into "sculptured snowdrifts" and are used for navigation. This is how it works: when the wind blows, snowdrifts are formed. The prevailing winds create mounds which are called uqaluraq and defined as a drift with a tip that resembles a tongue which is pointed and elevated from the ground. These are only formed by the Uangnaq (the west-northwest wind) and always show the west-northwest direction. A well established uqaluraq is even difficult to penetrate with a snow knife or a shovel, meaning they are long lasting, dense, and hard. They are so strong because of the wind that forms them - the Uangnaq doesn't blow at an even pace. It dies then it blows, then it dies, then it blows harder. As the wind fluctuates, it forms these special snow drifts. The east-southeast wind on the other hand blows very steady creating even and flat snowscapes. 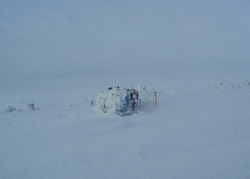 The Inuit traditionally used snowdrifts to aid them in navigation. The Inuit traditionally uses all their senses and knowledge when navigating. They look at every available sign of nature, including wind direction, snow drifts, land marks, vegetation, sea current, clouds, the behavior of sled dogs and other animals, and various astronomical bodies - the sun, and to a lesser extent the moon, and the stars. Northern lights are also used for navigation since they always are seen in bands running across the sky from east to west. Utilizing all these tools, the Inuit have been able to find their way without compass or GPS (global positioning system) across some of the most difficult conditions on earth. We of course use maps, a compass, and GPS when navigating. However, we are always very careful to listen to what we are told in the villages. We will be traveling on many ancient Inuit routes on our way to Grise Fiord. These paths have been traveled over countless generations. The routes were often marked by little stone formations that look like people and were chosen with one overriding consideration in mind: to be the best possible for dogsledding (in other words, they mark the trail easiest trail with the fewest rocks. Luckily, that tradition holds true for the snowmobile trails of the present as well. Inuit traditionally acquired a detailed knowledge about their land. Everything was noticed - even a little rock. When we ask an elder to draw us a map, it is amazing to watch them draw, not like we would from a bird's view, but instead they tell us, for example, to go "right at this rock" or "straight by the bend in the river." This minute attention to topographical detail is reflected in the Inuit "place-naming" practices. A bad rapid is called "Devil Rapids," Seal River has many seals in it, and so on. Today, many young Inuit do not understand or know the traditional names so they have "lost" a lot of knowledge about the land. We learned the hard way when some years ago we traveled right up and over "Blow Mountain." Let me tell you, it was really windy there. And I guess we are learning more lessons these days, too. We are traveling through the "Keewatin Region." Keewatin means "Where the wind blows!"